Everyone has memories of dressing up or taking on pretend roles when they were growing up. Moms and dads, doctors and nurses, teacher and pupils are a few of the role play games you may remember from your childhood. It is a normal part of development for children to play ‘let’s pretend’ type games and there are many reasons why parents should encourage their children to role play. Here are just some of the benefits of role play for children. Parents should allow the natural creativity and imagination of their children to run wild throughout their childhood. When children are creative and imaginative, it helps them to enhance their skills in many other areas in a fun way. Their choice of role play is often inspired by their own experiences of life so far, but may also incorporate their dreams for the future. Children playing is fascinating to watch as simple resources, such as a box, can become anything the child wants; a rocket, a bus, a dollhouse, a dog kennel, a chair or a boat. 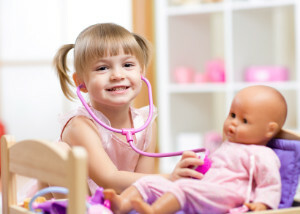 Role play can help a child to develop both their verbal and non-verbal skills. When playing with other children, they learn to read body language, extend their vocabulary and learn how to take turns in conversation. Even when a child is playing alone, they can develop their verbal communication skills. For example, if a child is playing with a dollhouse and dolls, then they will give their dolls different roles and act out conversations between them. These pretend conversations often reflect adult conversations and this helps them to further their communication skills. Throughout childhood, your child will develop their social skills. These include verbal and nonverbal communication, taking turns, the ability to work in a team, coping in different situations, and contributing to activities. If they role play with other children, they will develop each of these skills as they will communicate with the other children, work as part of a team, act out different life scenarios and contribute their own activity ideas. It is human nature to need other people and to want to be part of a group. While some children find it easy to make friends, others find it difficult to build friendships with other children. Encouraging role play helps them to interact with others and can support them in learning how to communicate, work as a team and contribute to an activity. Each of these skills can help them to make friends. Above and beyond all the educational and developmental benefits of role play is having fun. Childhood is the phase of life when there are no responsibilities to stress about and the focus is on having fun. Role play is a great way to keep your children entertained and happy, while also giving them the chance to explore new concepts and gain new experiences. Having a dressing up box is one of the simplest ways to encourage your children to role play. It will give them a range of options to take on different roles. You do not necessarily need to buy lots of expensive ready-made play outfits either. You can add some of your old clothes and accessories to the box or search second-hand shops for fun items the children can use. Some toys are also ideal for children to take on different roles and act out a variety of make believe scenes. 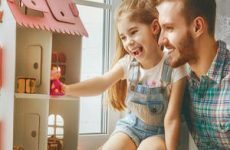 One example of this is a dollhouse as children love to play with their dolls in the dollhouse, acting out real-life scenarios that reflect their personal experiences in life or their aspirations for the future. Another option is a train set with characters as children can pretend their characters are traveling to various locations and act out different reasons for the journey. Not only is role play a fun and entertaining activity for any child to enjoy, it can also play an important role in many areas of your child’s development. Not only does encouraging your child with this kind of play support the development of their skills, it is also an opportunity for them to explore new concepts and use their natural creativity and imagination. Click here to check out our super cool dollhouses!